The British Museum has lost its crown as the UK's most popular visitor attraction for the first time in a decade, overtaken by Tate Modern. 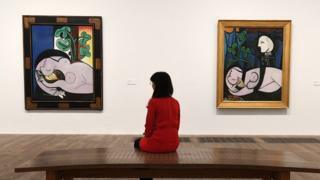 Almost 5.9 million people visited the Tate Modern art gallery last year, new figures show - just above the 5.8 million who went to the British Museum. Elsewhere, an exhibition of Terracotta Warriors helped visitor numbers to Liverpool's World Museum jump by 111%. According to the Association of Leading Visitor Attractions (Alva), the World Museum was visited by 1.4 million people in 2018 - 610,000 of whom saw the ancient Chinese statues. Birmingham Museum and Art Gallery also saw a big rise, thanks partly to the visit by "Dippy" the Diplodocus. The replica dinosaur skeleton was in Birmingham for five months as part of its three-year tour from the Natural History Museum. Birmingham Museum and Art Gallery welcomed 832,000 people in 2018 - up 38% on the previous year. Despite the overall rise in visitor numbers, some outdoor attractions had a dip - mostly blamed on the extreme cold spell early in the year. The country's second most popular garden, RHS Garden Wisley in Surrey saw its visitor numbers drop by more than 70,000.